IRender FAQ - Frequently asked questions about IRender nXt. 3.1.1 Which renderer should you use with SketchUp? 3.1.2 How should I get started? 3.1.3 Images I placed in my model do not show up in IRender? 3.1.4 What is High Dynamic Lighting? 3.1.7 This is a 6-sided cube viewed from the inside. There are no lights. Why is the ceiling brighter than the floor? 3.1.8 Is it okay if i turn off SketchUp when the the IRender pops up already doing its tracing? 3.3.1 Can I pause a rendering? 3.3.5 What is the difference between a true HDRi and the conversion you provide in IRender? 4.2 How can I make my walls appear white? 4.3 How can I balance the sun, sky and artificial lights? 4.6 How can I Render Water and Waterfalls? 4.10 Can I reduce the amount of aliasing at edges? 4.12 Are there limits to the size, resolution, etc. 6 How can I create a High Resolution Rendering? 10.1 Who are your competitors? 10.2 What makes you better than your competition? 10.3 Why should I do business with you? 10.4 Are you better than your competition? Go to the Downloads Page and select the latest version of IRender nXt. Uninstall the application. This will remove it from the old version of SketchUp. To uninstall, download the latest version, and if it offers Reinstall/Uninstall - choose Uninstall. If the only option is install - then skip this step 1. Re-install it selecting the new SketchUp location. Corner Bar - Other topics not related to prodcts. Which renderer should you use with SketchUp? IRender nXt costs just a bit more, but has many, many more rendering features. The additional features can make it seem harder to use - because to use special things like fog, depth of field, caustic glass, etc. you have to decide whether to turn them on and you often have to set values which effect them. These features can make even better renderings, but it may take more time to set them up. If you want to create better hi-res images from your SketchUp model, but don't want to have to learn how to use advanced rendering features - like Depth-of-Field, Special Reflection Settings, Special Transparency Settings, etc. then ArielVision is the right choice for you. If you are using SketchUp and rendering as part of your professional offering, and are using it to increase or support your business, then IRender nXt should fit within your budget. If cost is your primary concern, then ArielVision may be the right choice for you. Visit the Getting Started Page . First watch our getting started videos. Start with a small model, and learn how to use lighting and reflection before trying to render large, complex models. Use the Interior Lighting Basics to learn how to place lights. Use the Reflections Video to learn about reflections. Images I placed in my model do not show up in IRender? What is High Dynamic Lighting? We wanted to supply a lighting model which would work very well for exterior scenes - producing subtle shades and shadows - and would provide good lighting for objects. High Dynamic Lighting emulates the light in a forest, with the sun filtering through the leaves. It produces a very good rendering without having to modify your SketchUp model with lights and reflection. You probably turned on the Sun in SketchUp to get a better rendering. Turn it off for IRender and use High Dynamic lighting instead. Often new IRender users start with an existing, often quite large, SketchUp model they have to see how well it renders with IRender. You will get much better results if you are able to hide, or turn off, layers of geometry which are not visible. For instance, if you are rendering the outside of a house, turn off layers which have detail, furniture, etc. on the inside of the house. Or if you are modeling an interior, turn off layers which have details for the outside which are not visible. Because of the way a good renderer works, it is possible for geometry which is not visible to effect refections or reflected light. But very often the invisible geometry is not necessary for a good rendering. If that doesn't help, you may need to reduce the complexity of your model by removing, or simplifying, complex components. I am an architect and use SketchUp for my design. I would like your recommendation for a good rendering software which supports SketchUp. We think IRender nXt is the best choice. But of course, we are prejudiced because we are the people who have interfaced the nXt Rendering engine to SketchUp. Try it out, and I'm sure you will agree that we have created a powerful, and friendly, rendering interface. It is, or course, difficult to make an interface both powerful and friendly. As we add each new capability or feature to the rendering engine, we have to find places for them in the user interface, which can be a challenge, but we hope you agree that we retain the intuitiveness for which we are known. One of the things we have worked hard on is a set of 4 lighting presets, (outdoor, indoor, etc.) which make good renderings with little or no modification of the model. 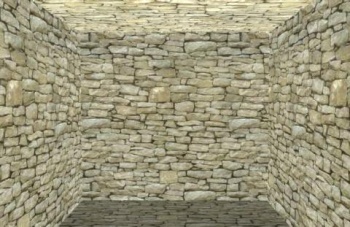 This is a 6-sided cube viewed from the inside. There are no lights. Why is the ceiling brighter than the floor? The ambient lighting is intentionally non-uniform-- more light is directed upwards. Is it okay if i turn off SketchUp when the the IRender pops up already doing its tracing? It is OK to close SketchUp after the extract, and when the Batch Renderer is running. There are three levels of Post Processing. One is simple changes you can make like Brightness or Burn. These are aplied to the rendered model and shwon in the rendered image witout having to re-render the model. Another is more complicated changed such as the Light Balancer which let you alter the intensity of groups of lights, again without having to re-render the model. The last is a set of PhotoShop like filters which make quick changes to the rendered image. These are things like Contrast, Sharpness and other standard image filters. I have hundreds of AR4 plants I created. How can I convert them to nXtRender Plants? You can import the AR4 plants into nXtRender and use them. But there is currently no way to convert them to nXtRender plants and then modify them as nXtRender plants. 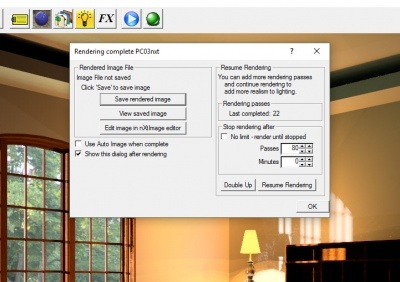 Can I pause a rendering? Whenever I hit the red button it stops and I have to restart. Pause is possible when you let the rendering complete the current pass. If you click the red button once, then it should stop at the end of the current pass. If you click the red button twice - the rendering will stop immediately, the rendering is stopped, not paused. 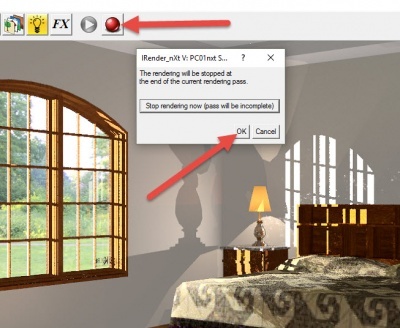 To successfully pause a rendering in progress CLICK Stop and allow the program to complete the current pass. Once the pass is completed the rendering is paused and the Resume button will enable. Please note: Double-Click Stop if you intend to halt the rendering in progress, or Click Stop rendering now (pass will be incomplete) when the dialog displays. When permitted to complete the current pass, the Rendering Complete dialog displays, and the Resume toolbar function is enabled. View saved image is typically used when the program option to automatically save an image has been enabled. Edit image in nXtImage editor is used to apply adjustments and filters as well as balance lighting. If a nXtImage file has not been saved the program will offer to save one. No limit - render until stopped if unchecked can be checked during pauseClick OK to continue processing the rendering that has been paused. Resume Rendering will continue to process the rendering, picking up from the last completed pass. 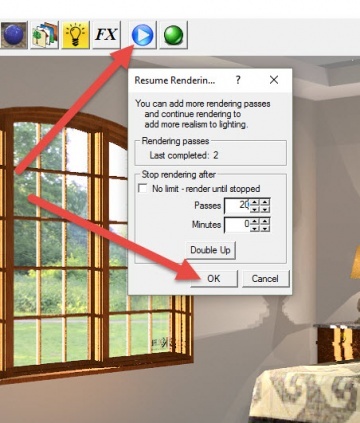 Click Resume, update rendering options then Click OK to resume the rendering, starting at the last completed pass. Bright spot, or speckle artifacts sometime occur during the rendering process. SketchUp scenes store the camera and layer settings, IRender nXt views store only the camera settings. HDRI Haven - A great site to get free HDRI images. HDRI-Hub.com - HDRI-Hub.com is your first address for royalty free, high resolution 360-degree High Dynamic Range panoramas and high quality architectural textures. These enable you to light and shade your 3D scenes photo realistically. You will find the panorama images and textures in our shop. www.accustudio.com AccuStudio Gallery - go to Exchange and then HDRI. What is the difference between a true HDRi and the conversion you provide in IRender? In order to make a "true HDRi" you take three pictures of the same scene - One normal, one under exposed and one over exposed. The normal, under exposed and over exposed versions are then used to determine which parts of these scene create the light. This light intensity factor is stored in the .HDR file, along with the RGB (red, blue and green) values for each pixel. We are able to use that factor to provide illumination for the rendered scene. When we do the conversion ourselves, we "guess", based on whether you tell us we are looking at a daytime image or a nighttime image which pixels are the light source. Here is a scene captured with three levels of exposure. 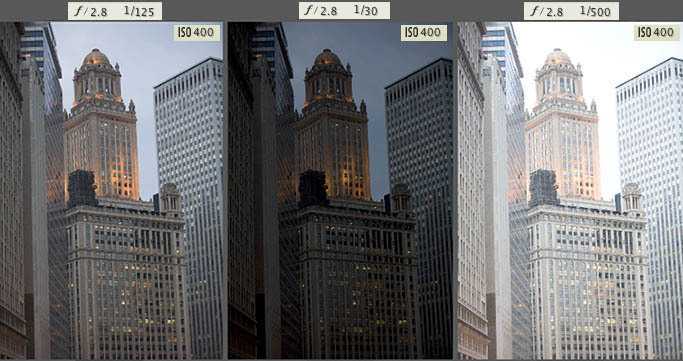 The routine which combines these three scenes into a .HDR file is able to determine that the sky and some of the windows are illuminating the scene. I've been using IRender for sometime but have never been able to figure out Highlights and reflection settings. I've started a ring model and would like to render a shiny metallic gold surface. How can I make my walls appear white? My walls appear white in SketchUp, but when I render them they are grey White Walls and White Backgrounds are often a challenge. You can make walls whiter in IRender nXt using a combination of Self Glow and the Brightness Slider . How can I balance the sun, sky and artificial lights? Use Lighting Channels to quickly balance the sun, sky and lights after rendering. Use the Lighting Balance slider to set the desired balance. Recently a user on our forum asked: "I placed a semi-transparent shower curtain in my model, but it rendered like glass. What can I do to fix this?" This is because IRender nXt, by default, treats all transparent objects in SketchUp as glass which reflects light and distorts objects behind the glass. Most transparent objects in SketchUp models are glass, so the default is to render them as if they were glass. I just noticed that IRender nXt doesn't seem to know what to do when you are looking at a mirror that points back to a mirror, which looks back to the original mirror. By default, we only process a couple of levels of multiple reflection. You need to change the setting for Reflective Bounces. How can I Render Water and Waterfalls? I am trying to render an image with a pool in it. Can you suggest anything like a preset, download (like with the grass) or tutorial to help me create realistic looking water? Thanks! Also I'd there a way to make the water look like it is falling? Like a waterfall or water feature. I just downloaded your free trial and rendered a quick design and it turned out looking good but the file size is 98kb and is really fuzzy when I zoom into picture. I didn’t find any help with this and I am used to most renderings being mb’s so I just wanted to see what I am doing wrong. You can set the desired resolution on the Render Setup Tab. A user was getting speckled lines in his rendering at the edges of walls. Can I reduce the amount of aliasing at edges? Angled lines between two materials can produce a jagged effect. By using Anti-aliasing, IRender nXt reduces the amount of this effect. Are there limits to the size, resolution, etc. Use the small or medium render preview size while working on your model. Smaller resolutions render much faster, and you can switch to the larger resolution when you are ready for the final rendering. Only model what you need in your scene. Items which are not visible just slow down the rendering process. You can organize different parts of your model by layer, or just simply hide items which are not needed. Try to simplify the components you are using. If you can use fewer sides for circles and arcs, or if you can use square, but smoothed, edges, then you can increase rendering speed significantly. See if you can replace some complex components with images. SketchUp and IRender both do a great job of rendering images, so for detail which is in the background using images instead of complex components will simplify the model and speed up rendering. Reflective surfaces, and lights tend to slow down the rendering process. See if you can get the result desired with fewer lights and fewer reflective surfaces. The answer depends on the number of cores and the processing speed. I thought I had remembered that processor speed was everything from a prior email. So, good to verify - as an FYI - so far I’ve tried 2 Dells one with a 6 core 2.8 and the other with a quad core 2.6 – that first one REALLY was noticeably faster. Here are 6 processor/speed combinations currently available for a Dell Precision T1500. However, it would not be faster when running SketchUp, and would not be faster when extracting the data for rendering, etc. Also, the video card does not effect rendering speed for IRender nXt. 32 bit apps, such as IRender nXt, run fine on 64 bit systems -- without noticeable performance degradation. We are not aware of any compatibility issues. How can I create a High Resolution Rendering? How is IRender nXt shipped? We send your license by email immediately after you place the order. Can I receive an invoice at the delivery address which includes VAT and the price in Euros please? Thank you in advance. I can send you an invoice, either by email or by letter (snail mail). We do not collect or report any VAT. I just purchased an educational license of IRender nXt a few weeks ago and just saw that the software was very recently updated to a new version. Will the 2.0 software that I purchased still be able to use the websites provided downloadable content, such as the Arrowway materials and vegetation creator? Thanks. You are entitled to upgrade to any new versions of IRender nXt for 12 months after your purchase date. The release of the 3.0 version does not change this, you can upgrade to it from 2.0. Hello, If I purchase the IRender nXt, is it still necessary to purchase the 3d pdf, and RP Tools? I'm a design professional if that helps. Thank you! IRender is just the renderer. RPS 3D PDF is a separate application for creating Adobe PDF documents where the client can spin the model around in the PDF display. RpTools is a set of handy tools for SketchUp. If you just want the renderer, then just purchase IRender nXt. If you want the other features, then purchase the 3D Design Studio . The order states that it was shipped last Jul 29 but until now I have not received it... Is it normal that 20 days after shipping it still has not arrived? Also, some clients tell Google Checkout not to send us their email address, and the relay of emails though Google Checkout gets lost. If you have not received a response from us after 12 hours, please send an email to Render Plus Support Email using your own email address. Go to our download page: Downloads Page to download the latest version. We will be sending you a license and further instructions when we process your order. After installing the Software, start SketchUp, it should appear under the Plugins menu. I was hoping you guys could release a student version at a discounted price. In any event, I love your software, and when I'm pulling in the big bucks plan to purchase it in the future. I just wish the future was now. We offer discounts for students, teachers, schools and classroom lab licenses. Students and teachers must provide school name and id. I would like to use IRender nXt on my laptop. Can I get a laptop license. We include a free laptop license for IRender nXt and other products. If you are registering on-line, just register from your main machine, and register again from your laptop. If you have any problems, send us an email to register from the laptop. 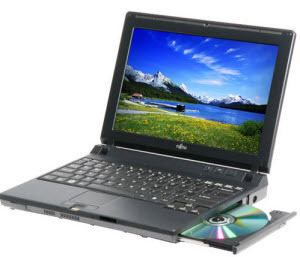 For other products, you can purchase a Laptop license for use on your laptop. Get a free Laptop Seat with IRender nXt. You can download the software from our Downloads Page and start working immediately. We will process your order as soon as we can. After you download a IRender nXt, see the Getting Started page for ideas on how to learn to use it. When you purchased a product from Render Plux, we sent you an email with your license number. If you have not received the email, check your order with Google Checkout. You license number should be stored in the Shipping Information in the order. If you still cannot find it, send an email to Render Plus Support Email and we will help you find it. I have not yet received the license number as of yet - please let me know. We have to wait for the order to be cleared by Google. This can take from 30 minutes to 2 hours. We generally do not process orders at night in the U.S., or if there are other reasons why we cannot access our order system. If you do not receive an email from us with your license number, send an email to Render Plus Support Email. Do not just respond to the Google email, because if you send us an email directly we will have your proper email address. After you receive your license number from us on-line (for some products) or by email. I plan on getting a better PC, and I will want to move my IRender nXt from my current one to the new one. With a single CPU license how will I do this? When you get a new computer, just send us a manual authcode request (using the Advanced button the license dialog), and remind us that it is for a new computer. One of my users has asked me to install IRender nXt on a second machine to use for batch rendering. The EULA clearly states that the software is licensed for one (1) machine. Am I correct in assuming that a second license needs to be purchased for the machine to be used for batch rendering? No, you do not need a license for the Batch Rendering machine. You need a license for each machine which is running SketchUp and wants to access IRender nXt or nXtRender from within SketchUp. You do not need a license for machines which are used only to perform the renderings using the Batch Rendering process. As long as these machines do not need to access IRender nXt from within SketchUp, they do not need a license. We have some competitors, and we compete well with them - High Quality, Photorealistic rendering and a powerful, easy-to use, User Interface fully integrated into SketchUp. We spend a lot of our time listening to our own clients and responding to their needs in order to make IRender nXt and ArielVision better than the competitive products. We're not better than them in all cases. But we have greate products, and continue to work to make them better. Because the products we're have now are better than the products we had six months ago. And in six more months they will be even better than they are today. We wake up every day with a sense of why we come to work. We come to work to be inspired by our customers to make our products do the things that inspire them. We check our forums for ideas from our customers – and then add most of them to the products. That makes our products better for everyone. If you believe that the things we do can help you, then we're better. If you don't the things we can do will help you, then we're not better. Our goal is to find customers who believe what we believe, like what we do, and want to work together so that we can all have better products. We're looking for people to stand shoulder-to-shoulder with us in pursuit of the same goal. bonjour, j'ai commande hier le logiciel irender pour sketchup. J'ai recu aujourd'hui un mail qui dit que ma commande... Vais-je devoir attendre encore longtemps? merci de me repondre rapidement. On-line translation works very well these days. Go ahead and send questions in the language you prefer. We will translate them using Google Translate, and respond as best we can. On-line Übersetzung funktioniert sehr gut in diesen Tagen. Gehen Sie vor und senden Sie Fragen in der Sprache, die Sie bevorzugen. Wir übersetzen sie mit Hilfe von Google Translate und reagieren so gut wir können. On-line de traducción funciona muy bien en estos días. Vaya por delante y enviar sus preguntas en el idioma que prefiera. Vamos a traducir usando Google Translate, y responder de la mejor manera posible. On-line traduzione funziona molto bene in questi giorni. Vai avanti e inviare le vostre domande nella lingua che preferite. Noi tradurre con l'utilizzo di Google Translate, e di rispondere nel miglior modo possibile. Le traduction en ligne fonctionne très bien ces jours-ci. Allez-y et envoyer des questions dans la langue que vous préférez. Nous allons traduire à l'aide de Google Translate, et de répondre du mieux que nous le pouvons.